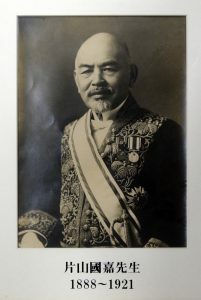 Associate Professor Kuniyoshi Katayama lectured “judicial medicine” in the University of Tokyo since 1881 before our department was founded as the first department of forensic medicine in Japan in 1889. He renamed “judicial medicine” to “forensic medicine” in 1891 since the department should cover legislation as well as general forensic practices. Dr. Katayama became the first professor of forensic medicine in Japan. The 2nd Professor Sadanori Mita also founded the serological department (Department of Immunology at present). He studied the antigen-antibody reaction and discovered complement fixation reaction. The 3rd Professor Tanemoto Furuhata was very famous for ABO blood group genetics, and also contributed to the development of criminology. He autopsied several cases of historical crimes. The 4th Professor Shokichi Ueno discovered a complex complement. He helped foundation of national police academy for death investigators. The 5th Professor Toshiyuki Miki could not perform autopsy for four years due to the University of Tokyo strike. However, he left many achievements in the field of blood typing and paternity examination. The 6th Professor Ikuo Ishiyama encouraged forensic pathology. He also introduced DNA finger­printing and PCR technique in the forensic practices. The 7th Professor Takehiko Takatori studied the biochemical changes of the lipid in cadavers. He dissected five victims of sarin subway attacks in Tokyo and identified sarin in tissue by a sophisticated method. The 8th Professor Ken-ichi Yoshida studied the molecular mechanism of ischemic heart disease and sudden cardiac death. Hirotaro Iwase has been directing our department since 2014 as the 9th Professor. In order to reconstruct the field of forensic medicine as the attractive one, six sections (forensic pathology, clinical forensic medicine, forensic toxicology, forensic radiology, forensic odontology, and forensic genetics) have started in cooperation with Chiba University. We are preparing to teach practice and research for the future forensic pathologists.